Do you ever look at the bare wall in the den, that tired and sagging couch, or those tatty tablecloths, and feel absolutely overwhelmed by the thought of tackling any of them? Which one do you start with? And then once you’ve decided, how do you know which steps, instructions or advice to follow? Just getting to the point where you’re ready to start can often take so much time and effort! It’s frustrating, because you know just how satisfying it can be to create something of your own – that sense of accomplishment and fulfillment can’t be beaten. What you need is for someone to pull together everything that you need to get started, to make it as easy and painless as possible. Good news – when the Ultimate Bundles team created The Ultimate DIY Bundle, they had you in mind! 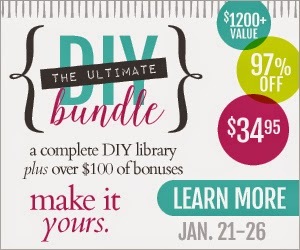 The Ultimate DIY Bundle is your instant go-to library for a whole range of carefully curated DIY and crafting eBooks and eCourses. No more trawling through the internet looking for good-quality, easy-to-follow information and advice: it’s all right here! For the crazy low price of just $34.95, you get access to a carefully curated library of over 76 eBooks and eCourses from the world’s leading DIY and crafting bloggers – enabling you to pick a project and jump straight into it with confidence. It’s the perfect tool to skip the information overload and throw yourself straight into a new activity.